In the last month I’ve spent quite a bit of time on the Dorset coast, for work and leisure. Like millions of other Brits I love going to the seaside: it’s a place where you can feel alive and at one with the natural world and the elements. These last few trips have got me thinking about the sounds of the coast. Our relationship with the coastline of the UK is shaped by a deeply sensory experience. All of our senses are heightened when on the coast whether it’s the touch of sand between our toes or the smells of fish and chips making us feel hungry after a busy day building sandcastles. There is something interesting about coastal sounds. Ask people about a sound of the coast and most would say waves, sea gulls or perhaps children laughing on the beach. And yet the coast provides a rich tapestry of sounds if you tune in to them. You’ll need to block out everything else but you can quite quickly build up your own unique and very personal soundscape. I tried this approach on Lyme Regis beach and the impact was amazing. The sounds of the poles for wind breaks being hammered into the ground, the masts of the yachts in the harbour flapping in the wind and hum of fishing boat engines as they returned to harbour. Yes there was lots of familiar and re-assuring sounds – my daughter yelping with delight as she ran in and out of the water or the tap, tap, tap of someone building a sandscastle – but it was a lesson in how you can see the world anew using your ears. My second trip to the Dorset coast was based around Sandbanks, a highly developed part of the south coast. A boat trip around Brownsea Island saw the wind whipping through the boat, the noise of the chugging engine and the chatter of people talking; there was lots of competition for your attention but you got a sense of the place through the sounds you heard. 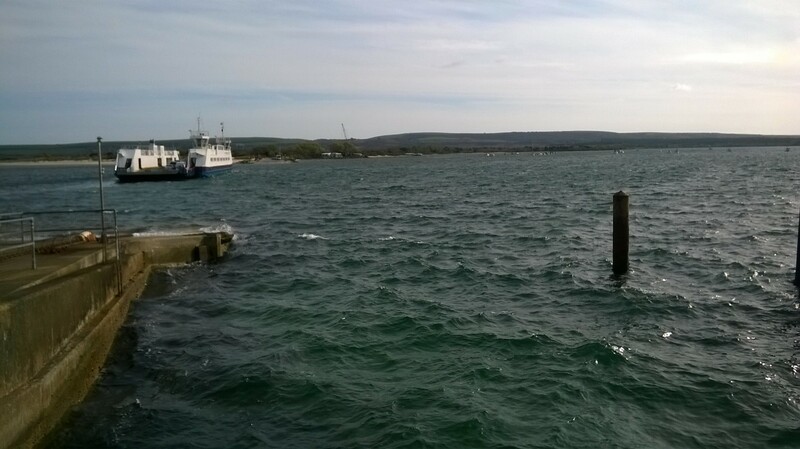 And then there was the intense and almost industrial sound of the clank, clank, clank of the chain ferry as it takes people between Sandbanks and Studland. This short trip is repeated hundreds of times a week and sounds reflect the journeys made to work, school and the beach. The sounds of the coastline and the memories that we have of them is shaped by our relationship with the coast. The sounds of leisure and day trips tend to dominate our sound memory banks yet the daily life of people going to work or working on the coast is an important part of the soundscape that follows the contours of the British coastline. So next time you’re at the coast trying tuning into the world around you and you might be surprised by what you hear. We’re fast approaching the beginning of a mass migration on these islands. Every Easter marks the start of an exodus to the coast. The two week break when the schools are off sees a huge movement of people via road and rail to the seaside. Traffic jams and delayed trains don’t dampen our spirits with the coastline in reach. Yes people visit the coast all year round but there is something symbolic about going to the coastline at this time of the year. The clocks will have changed (giving you that precious extra hour of daylight) and spring has sprung (or is nearly there) as nature comes alive in all of its colourful glory. Taking the sea air has become a bit of a national obsession since Victorian times. There is definitely something so refreshing about going to the coast that helps to de-stress us and makes us feel alive. Pretty much all my life I’ve been going to the coastline. Like millions of other Brits I love to paddle in the sea and feel the sand between my toes. But there is something pretty special about going on a coastal walk. We’re so lucky to have some of the most beautiful coastline in the world. The opening up of the coastal footpath around the Welsh coast was a world first. Its created a chance to literally wander for hundreds of miles, exploring some of the jewels of the British coastline such as Rhossili and Barafundle – owned by the National Trust. And in the South West of England a footpath follows the drama of a coast from Dorset all the way round to Somerset. I can’t get enough of spending time clambering up and down hills along this coast or stumbling across a cove or little estuary. The region for me is defined by its coast and the two big cities – Bristol and Plymouth – have been shaped by the sea. We also now have the promise that we will have a footpath around the coast of England by 2020. Walking along a coast gives you a deep sense of the topography and the rich history of our shoreline. You can travel through geological time, stop off at pubs hemmed in against a narrow strip of land or get a sense of the military back story of our coastline over the centuries. In barely a few generations the coast has gone from a place of work and often fear (invasion, pirates) to a place of leisure; a place that we have become so familiar with by walking its contours. This Easter if you’re visiting the coast see how your connection with the seaside blossoms through your footsteps. Take the time to stop and soak up this sensory experience – the sights, the sounds, the smells and taste. You’ll see the coast anew, I can assure you. Recently I came across some photos of me from when I was about three or four years old. Three pictures really stood out and they were all taken on the South Devon coast. They show me with my Mum and Dad and Gran who lived in Exeter – either building sandcastles or going for a little wander. 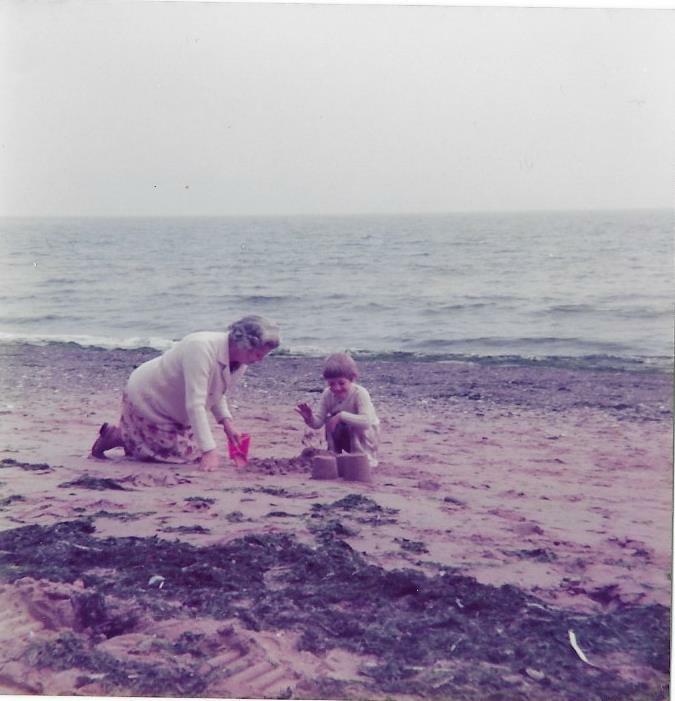 Many of my earliest memories are from those day trips to the seaside – especially Dawlish Warren and Exmouth. Holding those slightly faded colour photos transports me back thirty years. At Dawlish I can vividly remember the walk from the car park near the station up towards the sand dunes and the beach. First you had to pass the shops selling buckets and spades, deckchairs and beach balls before you made it to the sands. On the way back the smell of fish and chips wafted through the air and the temptation of an ice-cream with a chocolate flake was very strong. And there was the stunning walk (though I was probably a reluctant walker aged 3 or 4-years old) pinned up against the railway on one side and the beach on the other between Dawlish Warren and Dawlish. Its a spot everyone knows now thanks to the drama of the railway line hanging above the crashing waves pretty much a year ago. These memories of days at the seaside as children are part of our national DNA. Millions of Brits head to the coast every year. And there is a rich social history of the connections between the big cities and the nearest stretch of coastline. Begun with the expansion of the rail network and helped by the arrival of paid annual leave in the 1930s people from the East Midlands headed east to Skegness and the Norfolk coast while for the West Midlands it was Wales and especially Somerset. Its something that has been traditionally repeated across the land. A day trip or holiday by the coast still excites families up and down the land. We took our kids to Lyme Regis for their first experience of the coast – paddling in the water and eating sand. When ever we go to a beach, whether in Cornwall or Pembrokeshire, as soon as we’re out of the car they’re off, running, laughing and having fun. Its these powerful memories of ice-creams on the seafront, the smell of fish and chips or the laughter of children that enrich of our love of coast. Paddling in the cold Atlantic in August, clambering over rocks to a hidden part of the beach or a car full of sand create those moments that we cherish and talk about as families. But its also a shared collective experience with people that you’ve never met before for those few hours that you have become a community based around that one place at the seaside. Recently I spent time on the Exe estuary watching Brent geese fly in formation across the silver winter sunshine drenched mudflats. This was a place I knew well growing up and it felt good to be back; partly through nostalgia and partly through the freshness of the coast that day. The seaside towns and the miles of golden sand that we visit as children and adults, though constantly changing, are a constant in our lives. Somewhere where we can vividly imagine a past of happy days and a place that we can return to physically or in our daily thoughts. 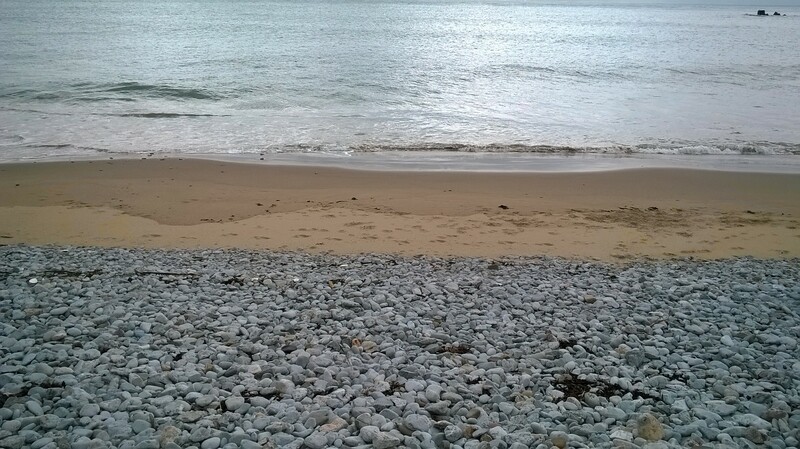 Spending a day at Lyme Regis got me thinking about why the coast matters to us. It’s much more than just being an island nation though thats an important factor. We like to gravitate to the coast. It is something that binds the generations: a kind of social glue. 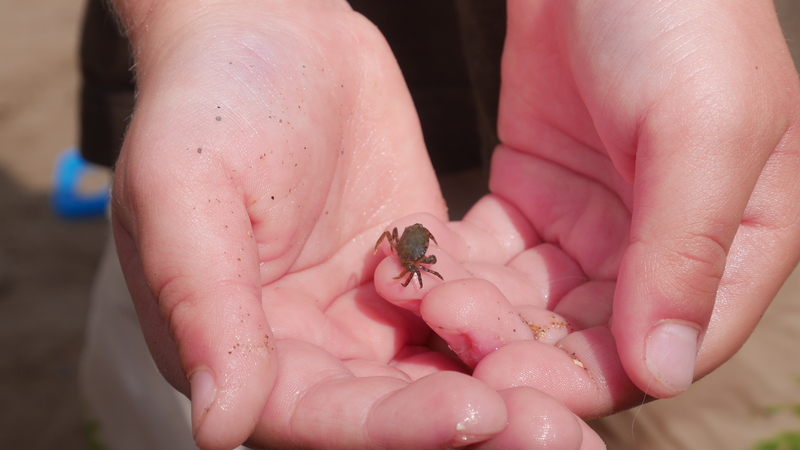 My own mini mass observation project on the Dorset coast showed that the power of the seaside is compelling. We change in character and the cares of every day life float away. The muffled sound of children laughing, the chatter of contented day-trippers and the melodic sound of the waves create an intoxicating effect. A trigger in our mind equates the coast with a sense of happiness. We tap into our memories of childhood spent crabbing, building sandcastles and anticipating the nectar of an ice-cream. The Victorians saw the coast as the place to revive our constitution; the perfect place to take the air. In modern times our quest is for a connection with nature, the sense of coming together and a journey to a place where we can dream. For me the coast fires our imagination. The rules of the treadmill of life are suspended and we get closer to the natural world. We are drawn to the coast by this magnetic sense of being somewhere we’re not judged and flourish on the collective endeavour of getting there. A journey to the coast is exhilarating, wondrous, emotional and tiring. It becomes addictive: we need our fix of the seaside to keep us going. That is why the coast matters.